I borrowed this stamp a while ago and I forgot to write down what company made it to give them credit. When it was done shrinking I carefully picked it up and set it on my counter. I took a glass with a flat smooth bottom and pressed it onto the piece. I held it for about five seconds and then let it sit to cool. Being careful not to touch the areas I colored I moved the piece to a place where I could pour on some Crystal Effects. Once the Crystal Effects dried I added a pin back and when the glue set the pin was ready to wear. I have not played with Shrinky Dinks in a long time. They are SO much fun. It's amazing how much they shrink too!!! These make great gifts and are a fun item to have at craft fairs! Oh my, I just can't believe how fast this month has flown by. 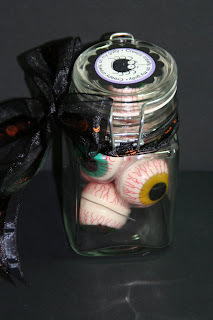 I still have LOTS of Halloween ideas to make but I guess I will tuck them away in a box and save them for next year. But I will keep some of them out since I can convert them into Christmas with just a simple change of color of paper!!! Goota LOVE that!!! These cute party favors are made using the Big Shot die cut "Baskets & Blossoms Bagz" by Stampin' Up! I LOVE using this die cut. I am planning on using it a lot for Christmas "stuff!" For this project I only used the basket part. I cut out 4 and glued the side seam to the inside of the other edge. Then I glued the bottom and ran it through the crimper about 1/4". I wanted to use it to help set the glue faster and to give the bottom a little bit of a crimp. Stuffing this little favor full is not going to make the bottom pop out on this one!!! 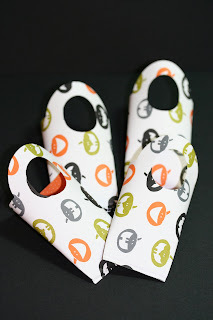 I wasn't sure what I was going to do about the handle hole but after looking at my options (a million of them) I decided to go with the Stampin' Up! "Batty for You" images. I punched them out using the 1-1/4" punch and I taped them on a circle that was punched out using the 1-3/8" punch. And finally I taped that to the scallop that was punched out in Basic Black card stock. I did glue them to the handle area. I just added a dot on the top and a smaller dot on the bottom VERY close to the rim of the circle. There isn't a whole lot of room there to spare! Be sure to look before you glue. I just noticed that next week is my Blogoversary! I will begin my 3rd year of blogging. Can you believe that???? 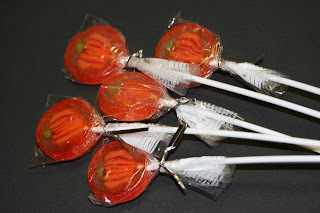 So to celebrate I will be offering up some blog candy so stay tuned!! I was up late last night and there was this noise on my computer letting me know an email had come in. Well, it was the Wednesday SplitCoastStampers Sketch Challenge. SO of course I had to print it out and give it some thought!!! And as I look at it I keep thinking that it could have used a LOT more thought!!! I'm not overly thrilled with my card. It's kind of blah looking. But I'm leaving it as it is. Right down to the mark under the tree from the rubber on the bottom of the tree being too long. I do need to trim that up a bit. I do like the layout and I think I'll try it again sometime!! If you have time go on over there and give the sketch a try!! This one is pretty simple and I am anxious to see what the other stampers do with this layout. I saw some with ribbons across where the two papers meet. I couldn't do that or it would mess up the tree. Like I said, I'm not that thrilled with it but I'm not going to do anything about it!!! 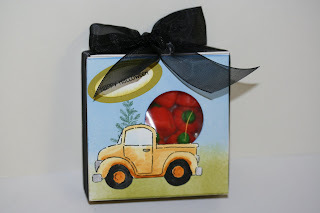 I have seen these adorable mini pizza boxes on several blogs plus on SplitCoastStampers (SCS). I thought it would be fun to make so I added it to my list of things to try. It is indeed VERY simple to make and they are VERY mini!!! I was surprised at the size. I guess I was expecting something a bit bigger. But I think the pattern can be adjusted to however big you need it as long as you stay within the size of your card stock. A 12" x 12" sheet would make a pretty nice size box but it would be pretty fli msy. Keep that in mind if you are considering changing the box at all. I got the box from "Lynn in St Louis," it's her SCS name. If you click here you can find all the information you need to make a box yourself!!! I didn't plan to make mine using Kraft card stock. I just grabbed a piece of card stock that I had a lot of because I figured I would somehow mess this up on my first try. Well, there isn't a whole lot to mess up on these. Much to my surprise!!! And after putting it together I decided to just run with it. I have a TON of things running (rolling or even bouncing) around in my head using a mini box like this. I'll be sure to post them here for you to see!!! I used Treasures on the inside of mine. I stamped the images from the Stampin' Up! 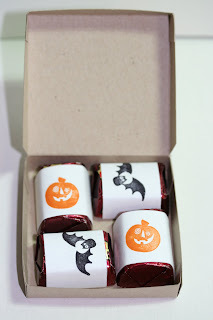 set "Halloween Frights" on address labels and stuck them to the candy. Then I decorated the top of the box. That is pretty much all there is to these little boxes. And being they are so quick to make you can spend more time decorating the outside or you can make a bunch of them for gifts or for craft fairs!!! There's a lot of things you can use these little boxes for!!! I was looking at some more of those cute Bag in a Box bags and I thought I would try to make some Scarecrow Pants using the new Stampin' Up! decorative papers. I added a few fun things to mine to make it look more like pants. First I added that black tapered strip in the front to separate the legs. Then I added strips of Creamy Caramel for the straw. The belt is made using a 1" piece of black card stock. I taped it around the top part of the bag. I made the buckle using a piece of Brushed Gold card stock and two square punches. I cut two 7/8" pieces of the decorative paper for straps and I added two red buttons. It's pretty simple to make. Fill it with fun things such as candies or toys. I think this could even be used for Thanksgiving as well. You could get 2 holidays out of this one!!! It was very fun to make and it really didn't take all that long to make either!!! I bet you were thinking this was going to be a scary post, weren't you??? Sorry to disappoint you!!! I was surfing the net and at Mary's Creative Juices blog I found the most adorable card. On hers she had used some glitter on the ice cream parts and I liked it but I thought I would give these tiny glass beads a try. I had gotten some samples of various size beads WAY earlier this year and had not had much time to play with them. I did order some of the extremely tiny clear glass beads. It has the consistency of sand. I had seen something like it at a stamping store many years ago and I believe they called it "Moon Dust." I'll post the information and contact person at the bottom of this post. I really liked the way that Mary listed the supplies she used and I may have to start doing that with my posts. I like just seeing the list instead of finding each item you need as you read along. I found that scanning the list lets me know quicker if I have all the materials to make the project. So here it goes!!! First I punched out the scallops in the three colors listed. I cut the top so it was rounded like the ice cream would be on top of a cone. I taped the three pieces together and brushed a thin layer of Crystal Effects over it and then immediately dipped it in the extremely tiny beads. I tapped off the excess and set it aside to dry. I took a scrap piece of Kraft card stock and ran it through my Cuttlebug folder. I cut it to resemble a cone and sponged Close to Cocoa ink over it. I cut a piece of gingham paper from the Bella Rose collection to measure 4-1/4" x 2-5/8". I cut a piece of Chocolate Chip card stock 1/8" larger than the decorative paper. The Pretty in Pink card stock measures 5-3/8" x 4-1/8". I ran the words through the computer printer and punched them out. I punched out a pink oval and then using the largest new oval punch I punched out a piece in Chocolate Chip. I taped them all together. After taping the layers on I added the cone and the wording. I set the pearls in place and glued them down with Crystal Effects. I taped on the corner piece and the card was done. Isn't it just the most adorable thing?? Mary is such a clever person!!! Ok, about the beads. I got them through Molly at Deco Bead Depot. Her number is 215.635.1366. You will be shocked at all the sizes of no hole beads there are. They even have the ones to do beaded pens with!!! And the colors these beads come in will just astound you too!!! Be sure to tell Molly where you heard about the company. I don't get anything for it but I'm sure she would like to know! 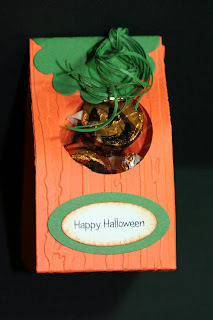 Transform a simple 2-4-6-8 Box into a square pumpkin treat holder! Cut your card stock in half so you have an 8-1/2" x 5-1/2" piece. On the long side score at 2", 4", 6" and 8"
Turn and score on the short side at 2"
Holding the card stock in front of you with the long sides on the top and bottom you will be snipping the bottom. So on the long side, snip the score lines up to the two inch horizontal score line. This is the bottom of the box. There is a small rectangle piece at the bottom, either on the right or the left depending on how you scored your card stock. You probably already snipped one side of that as instructed above. Now snip away that little top part of it and discard it. 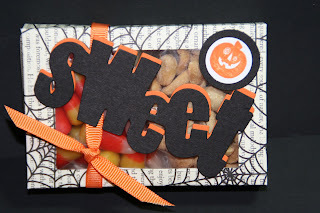 That ½" scored strip will be tucked inside the box with either tape (Sticky Strip by Stampin’ Up!) or with glue. Now fold all of your score lines. The way I see it on mine is the front is the side my scoring tool touched. Fold your lines inward. Next I punched out the hole for the window. I used the 1-3/8" circle punch. To get it centered I punched a circle from copier paper and traced it on the card stock where I wanted the circle to go. I was able to get it pretty centered. I then punched it out and erased any pencil marks left behind. To determine which panel you want the hole to be just fold up your box (don’t glue or tape it together) and look to see what looks like the front to you. There is no right or wrong one to pick though it is best to have the flap part to the back of the box. For mine, I folded it in half and placed it in a Cuttlebug folder. I’m not sure what the name of this folder is but it creates some nice lines in the paper that (for this project) look like the lines in a pumpkin. If you squint REALLY REALLY hard you can see it!!!! LOL I refolded my score lines after it came out of the Cuttlebug folder. Take a piece of acetate, Black Staz-on ink and your stamp and stamp the face on. I used the face from the Stampin’ Up! "Autumn Harvest" set. Once the ink was dry I taped the acetate in place making sure the face was centered. I also stamped part of the larger pumpkin on Garden Green card stock and cut out the stem and set it aside. The next thing I did was to tape the box together. I taped the small side seam first. Then I folded the bottom pieces in to see which ones I wanted to go first and I decided to fold in the left panel first, then I taped the right panel, then the back one and finally the front piece. With a pencil I lightly I marked the sides at 1". I wanted to make sure I found the center so I can pinch it inward. I added the candy. For mine I used Hershey’s caramel filled Kisses. Sorry I didn’t count how many before I stapled the top shut. Next I headed on over to my Big Shot and used the smaller scallop die cut and cut one out. I taped it in place over the top. I tossed out the stem of the pumpkin I had stamped and of course cut out. It no longer would fit on the box. I took my Crop-a-dial and punched a hole just off center on the top of the box. I cut 5 or 6 little slivers of Garden Green card stock from a 5 inch long piece of scrap. I inserted an eyelet in the hole and set it in place. I slipped all the ends of the little slivers of card stock in the eyelet hole and tied a single knot with them all. I wrapped the ends around a pencil to give them a little bit of a curl. I printed out the words "Happy Halloween" on the computer using the "Ice Aged" font. I punched that out using the small oval punch and I punched the Garden Green out using the larger oval punch. I sponged the edges of the smaller oval using Pumpkin Pie and I had inadvertently grabbed a dirty sponge so it isn’t a bright orange but it still worked!!! I then taped the ovals together and taped them in place on the box. And that’s it. It’s not a REAL quick project but it does go pretty fast. These make great Teacher Gifts, Hostess Gifts and Customer Appreciation Gifts. It is a project that kids can do with some help and supervision. But mostly they are VERY fun to make!!! I told you I wasn't done with "Halloween Week!" I still have a few more projects up my sleeves to do before the end of the month!!! If you are looking for all the 3-D items I made during Halloween Week just click here and you will be taken to them. 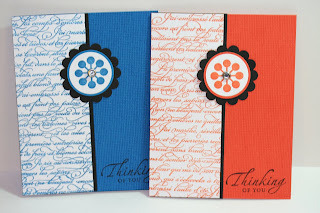 For this project I use the Stampin' Up! set "Loads of Love." I just LOVE that little pick-up, don't you??? 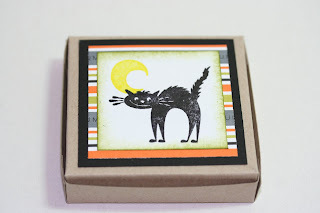 I had gotten the pattern for the box at Stampin' Up! in the Show & Tell patterns and templates section (for demonstrators only). I printed the box out on Glossy card stock. I did print it out on the back side of the card stock. Well, the second time I did!!! LOL After cutting it out I sponged on the Old Olive for the grass at the bottom and I sponged on Ballet Blue for the sky. Then I stamped the tree from the set "Lovely as a Tree." After I had stamped the tree I regretted not stamping the image higher but after putting the wording on the height of the tree didn't matter after all. When I was all done coloring what I needed to I punched out the circle with the 1-3/8" punch. I put a piece of clear acetate over the hole. After I added the candy I taped the bottom shut and added the ribbon around the box. The wording was done on the computer and punched out using the two Stampin' Up! oval punches. The car was stamped on Whisper White card stock (I had stamped a few of these trucks when I was at Sue's for DIVA Day earlier this month). Yes, another set I do not own, if you can believe that!!!! LOL I colored it in using a blender pen and More Mustard. I added a bit of Bashful Blue with the blender pen on the windows and headlights. I used Going Gray for the bumpers and Basic Black for the wheels. I cut the truck out and taped it in place just below the punched hole area. And that was it. It took longer to cut the truck out than it did for any other part of the project!!! It was quick and very fun!!! This would be great for Stamp Camps, Craft Fairs, Kids Projects, Hostess Gifts, Customer Appreciation Gifts and even a Make n Take!!! Here's a fun project that anyone in the family can make. Though a bit of supervision with the scissors and the little ones is always recommended!!! I took the suckers and added the layers of punched card stock on them. I had stamped the images at Sue's because I didn't have this set. I punched a full sheet and I'm still not out yet!!! It is such a cute set but I bought some other Halloween sets so I had to limit myself!!! This Stampin' Up! set is called "Batty for You." It's SO much fun to play with!!!! After I got all the pieces punched out (the images with the 1-1/4" circle punch, the next layer with the 1-3/8" punch and the scallop circle punch) I taped them together. Then I used sticky dots to affix them to the suckers. I did cut the sticks of the suckers, those things are around 12" long or even longer. I just know they are long!! I found this adorable coffee cup at Michael's too. Isn't it cute??? I filled it with those glass marbles and stuck the suckers in. I didn't like what I saw and thought the top of the marbles could use something. SO I was going to put vanilla Tootsie Rolls on top because I was making this for a friend who LOVES those!! And then I thought why not try to just fill the cup with the Tootsie Rolls and no marbles. I dumped the marbles out and after picking up a hundred of them off the floor (chasing the cats away while doing that) I filled the cup with the candy and proceeded to add the suckers one by one. I did have to trim the bottoms of the sticks to get them to stick in the cup in various lengths. 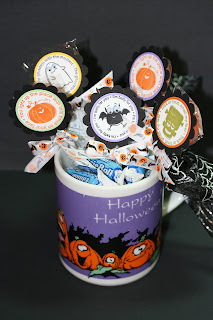 I added some fun Halloween ribbon I had to the cup handle but it still needed something more. So I went back to my wall of ribbon and found some cute smaller ribbon and added a piece to each sucker. That was it!!! I liked it and I'm sure my friend Ann will like it too!!! 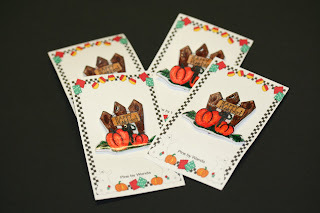 Now I don't know if you can remove the card stock without ripping the packaging because these would be great for Thanksgiving too since they are only a pumpkin and not a jack-o-lantern!!! This is a fun project for kids to play along with too!! A great teacher gift item as well!!! I still have a few more Halloween items to post before the SPOOKY day!!! It's always good when I have a Wednesday that I can participate in the Sketch Challenge over at SplitCoastStampers. I have played with SO many new card layouts. And there are a lot of them I go back to when making cards. Today's layout was very fun. Though I am one who loves LOTS of layers. I did keep my card very simple. I didn't embellish much, though how could you on a card like this???? The stamp set is by A Muse. I bought it last year but don't know if I ever got to play with it. From looking at the back of the stamp I would have to say that I didn't but then again I try to clean them like new!!! I stamped the image on watercolor paper using Black Staz On. I colored it in with a blender pen and markers. I used Bashful Blue card stock and stamped the wording in using Bashful Blue ink. I wanted it muted and that did the trick. The left panel is done using a piece of decorative paper I had gotten at Michael's. I had some scraps. Isn't it fun to use the scraps??? The snowflake is made of acrylic and I set it in place with Crystal Effects. I also took a little Crystal Effects and a toothpick and added some glitter to the star. It doesn't show up very well in the photo but in real life it sparkles so nice. And the final part was the background. I used a piece of white card stock and the Snowflake Cuttlebug folder. I sponged all edges in Bashful Blue except for the decorative paper, I left it as it was. Such a quick and easy card to make. 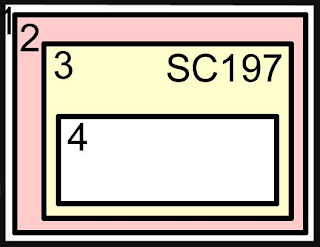 I believe there are measurements for the sketch is included at SplitCoastStampers. I don't use them. 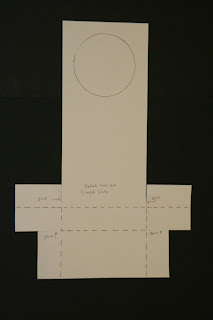 I print out the sketch and just measure the areas. Most of the time I just put a piece of card stock in the area and mark it with my fingernail and head on over to the paper cutter. I don't like to measure if I don't have to. I measure after so I can add a layer behind the design but not for the design itself. If you have time head on over to SplitCoastStampers and give this sketch or any of the other sketches they have a try. It's a lot of fun!!! I've had several questions come in about the cling film for this technique. Cling film is the stuff you use to cover your food, bowls, etc. (and now iron with!!!) LOL I did go into my post and change the wording to cling wrap, though I think that is a brand name too. It comes in the rolls like aluminum foil, waxed paper and parchment paper do. And you place the napkin on top of the cling wrap face up. I am going to reprint the instructions for that. I try to be clear on my instructions and try even harder to never take any steps for granted but sometimes I slip up!!! Thank you all for being SO observant. Now I know my blog really IS being read!!! In sticking with the Halloween theme and season I thought I would do one of my technique pages to go along with it. I found these adorable napkins at the grocery store (Cub Foods) and I not only liked the front as a focal piece but the back of it for a background piece. Such a versatile napkin, isn't it??? And I don't know which is more adorable, the front or the back!!! 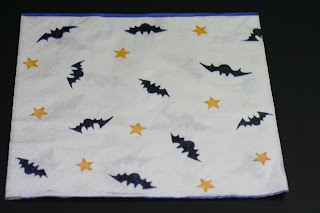 This is a fun technique and will work with most 2 or 3 ply napkins. Single ply may not work as well but hey, you can always experiment. Isn't that how most of these techniques are discovered???? Cut your card stock just a bit smaller tha n the napkin. Place a piece of copier paper on a surface that can be ironed on. Place your card stock on top of that. Tear off a piece of cling wrap to cover the card stock. Pull your napkin apart so you only have one ply/layer. Cut napkin to fit over card stock and cling film. You do want the napkin just lightly larger than the card stock. Place napkin face up. Cover with another piece of copier paper and with iron set on medium iron over the copier paper. Be sure not to get any cling wrap on your iron. Go slowly and use a little pressure for about10 to 15 seconds. Remove the copier paper and trim the excess cling wrap from the edges. As soon as it cools you are ready to use it. If there is any loose edges you can reheat them between more copier paper. The cling wrap will give the napkin the look of fabric. Use as a background or cut pieces out and use as a focal piece. There, that wasn't so bad, was it? I was just amazed at how the napkin felt like fabric on the card stock. I do not recommend stamping on the napkin (before or after doing this technique). Napkins are so thin and the ink will bleed. Unless that is the look you are going for I would suggest you stay away from it. Have fun with this technique. Anytime you like you may share with me what you make using these techniques and with your permission I will post it on my blog!!! And all you have to do is email me!!! Here is a card my friend Sandi made last week at my home. She used the Stampin' Up! 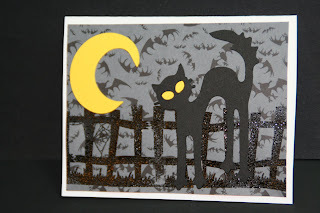 "Frightful Fence" jumbo wheel and the Sizzix "Cat and Moon" die cut. The fence was embossed on decorative paper. Isn't it adorable?? 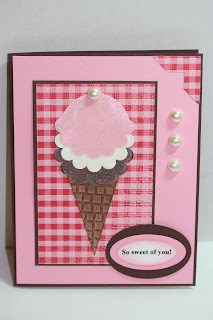 It just shows you how you can combine stamping and die cuts and create something fun!!!! Just had to show this to you all!!! I have some pretty talented stampers that come here to play!!! 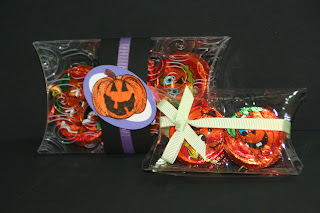 Need something fun for the babysitter or a teacher or someone who can't have candy??? This was not only fun but quick to make too!!! You will need a bag of microwave popcorn, a piece of glossy card stock cut 7-1/2" x 9", three sponges, three different color ink pads and die cuts. First I folded the card stock around my popcorn. I used the bone folder on the folds to make them nice and sharp. I set the popcorn aside and proceeded to color the background with the sponges. I used Old Olive for the ground. I just inked up my sponge and ran it across the ground area horizontally. I repeated that process for the other two colors, Pumpkin Pie and Night of Navy. 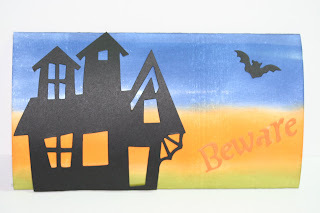 Then I used my Sizzix Halloween Die Cut and cut out the house. I just love the little bat that came with this one. 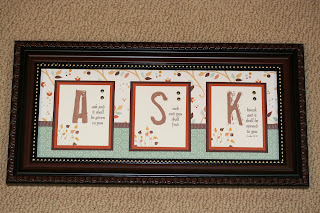 The words are from another die cut and after seeing it done I wished I would have cut it out of Old Olive or black too. The Pumpkin was just too light. It does show up better in real life but it could have been darker. I glued them on with Tacky glue and a tooth pick. The house and bat I was able to use double-sided adhesive. The letters were just too small for that kind of tape. Once the glue dried I slid the popcorn in and it was done. SO simple!!! And not to mention fun. This is something that kids can do too!! It's always fun to find kid friendly projects!!! 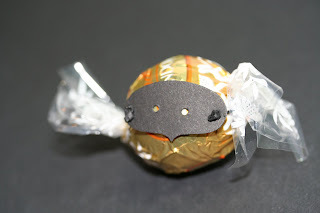 I had some emails asking me to show the punches used for the Lindor Halloween Candy Mask. I used the Key Tag Punch and the Tab Punch. I was punching out some pieces using the Tab Punch when I discovered the "mask." 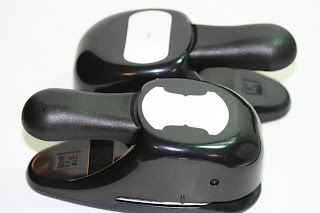 I had punched them just far enough apart that I was able to punch out two masks with the Key Tag Punch. But at first I was only able to punch one. It's very simple to do and if you tape the strings on the back instead of tying them it goes so much faster. If you have any more questions, please be sure to email me!! I was using my Tab punch and as I was looking at all the scraps I was tossing I thought that the center part of the scrap looked like the nose part on one of those party eye masks. SOOOO, I was wondering what I could to do make it look more like a mask. I punched the piece out and realized that the hair binder things would be too wide for the mask. Hmmm, what to do. I was going to use black hemp. I knew that would work but then I thought, "not everyone h as black hemp on hand" so I wanted to figure out another way to attach it. Now there are two ways of attaching this to the back of the candy. You can tie a knot. I found it a bit difficult but it can be done. Or you can use double stick tape and tape it in place. To get the rest of the tape from being sticky on the back you can use corn starch. Don't use baby powder, you are working with something that is consumable. Not that I would eat mine, it's just TOO darn cute!!! These would be fun at your next Halloween party so you'd better get started on them now!!! These would be great at Craft Fairs too!! And what customer wouldn't LOVE one of these treats?? Thank you SO much for stopping by and indulging me!!! Did you ever see that movie "Jeepers Creepers?" I did and it gave me nightmares!!! And I watched it again!! LOL I just never learn!!! But it's only a movie, right???? If you didn't see it and like horror movies it's a scary one but if you don't like horror movies than stay away, even when it's aired on tv with all the chopping up of it they do, it's still scary!!! Anyway, I did have to trim the container they were in. It has little tabs on it to open them up easier and I had to cut them off. And I had to tape that part so they'd stay shut. You can't see the tape when they are in the jar. 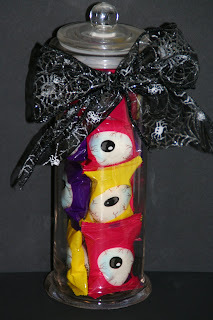 Just find a jar and fill it with eye balls. 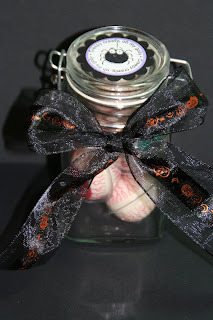 Tie a ribbon around the jar and on top I added a scallop and circle layers with the Stampin' Up! "Batty for You" set. It's such a cute set and I regret not ordering it. I stamped a number of images when I was at Sue's on DIVA Day a couple of weeks ago. I had to limit myself when ordering stamp sets and then there was the decorative paper for Halloween and the wheel and and and!!! I am having a lot of fun with the ones I bought but you know how it goes, the grass is always greener on the other side!!! But I got to go to the other side and play for a bit so that was ok!!!! LOL Sharing is good and Sue is SO good about sharing!!! I stamped a sheet full of images and have been having fun with them! 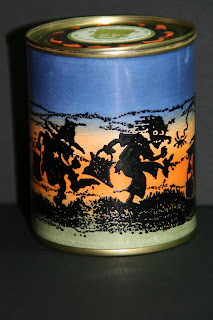 Continuing on with the eyes today, the tall jar was given to me by my friend Peggy!!! And I filled it with marshmallow eyes (just as gross). I got them at The Dollar Tree. They were creepy enough too!!! I had made another layered scallop for it but forgot to put it on before I took the photo. I guess I was TOO anxious to get the picture taken. Who knows what I was thinking!!!! And one last thing involving the eyeballs. 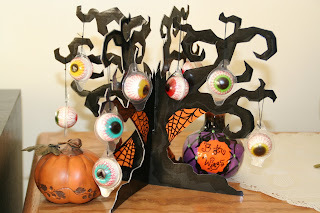 My friend Katie gave me this creepy eyeball tree!!! And again it's got one of those REALLY creepy green eyes in it. Sends shivers down my spine!!! LOL Isn't it just adorable. I don't know where she found it so I can't share that with you. Maybe she'll leave the information in a comment and you can read it in the comment section. I do LOVE the tree Katie, thanks SO much!! SO that's the Jeepers Creepers post for today. Halloween Week is drawing to a close and it has been VERY fun. Though I am really not done yet with the 3D stuff so you will want to check back for some more fun ideas for this Halloween season!!! 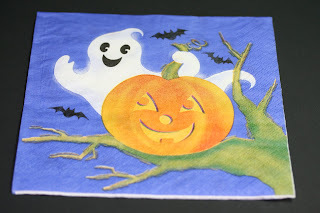 I did not participate in the Wednesday Sketch at SplitCoast Stampers this week because I was having too much fun with Halloween Week and when I saw the sketch I was glad I didn't have time. It looked like a REAL challenging one and I just wasn't up for it!!! I will eventually do it but not this week! And I did not post a technique page this week either so I will be doing it next week, probably two of them!!! I know there are many of you who are waiting anxiously and patiently for me to finish up the next set of 20 so I can get them sent out to you. It's about at the half way mark I believe. I'll have to check on that and let you know when I post the next one!!! Have a VERY fun weekend and enjoy the projects! 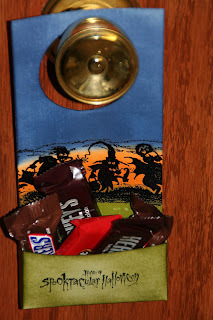 Here is a fun door know treat holder to make. You can hang these on your neighbors door filled with treats. 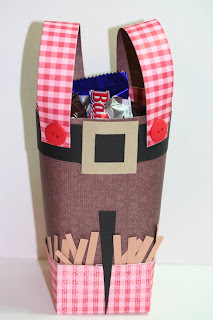 You can bring them to work and hang them on co-worker's doors filled with candies or office supplies!!! There's lots of ways to use these treat hangers. Kids and adults alike would have fun making and receiving these!!! For mine I use the Stampin' Up! "Haunting" jumbo wheel. The same one I used for the tin can yesterday. It was so easy to color and I thought I would work with it once more. I was using glossy card stock anyway. I chose glossy because it's a bit stiffer than the regular white. I wanted it to have some substance to it, after all it is to give away and I want it to be durable, plus it's going to be holding CHOCOLATE!!!!! To make this holder you will need a piece of glossy card stock cut 7-3/4" x 11. You will be scoring your card stock as follows. On the shorter side score at 2" and 5-2/4". On the long side score at 2" and 3" and also score at 4" but only score up to the long score line on each side. You don't want to score all the way across because this is a flap for the backside of the holder. It's what will keep the holder together as a pocket. Now turn your card stock around so the shorter side is back were it was at the beginning. You are going to be scoring at the 1 inch mark from the bottom to the first score line you you come to. You really don't NEED to score here, you can mark it off with a ruler since this piece is going to be removed. I just found it easier to score it and then cut on the score line so it is straight. Once you are done scoring, snip the parts that need snipping (see photo for that) and cut away those bottom two corner rectangles. You can click on the photo for a closer view. To decorate your card stock stamp your images on the shiny side. But remember when you form the pocket the back of the card stock will be folded over to the front (where I have the words on mine). Fold your score lines up so you know which way to stamp the image on the other side. It's very easy to figure out. Now that I see mine with the candy in it I wish I would have stamped my images closer to the door knob hole so you can see them better. But this was my first one so I can fix it on future ones!! Once you have gotten the stamping done Use the Coluzzle to make the hole for the door knob. I used the 4th circle from the center. Now use the Stampin' Up! Sticky Strip to tape it together. You really do need some strong tape for this. You do want it to stay taped!!! This is really a fun and easy project to do. These would be great too for a teacher gift. You can have everything cut and scored for the kids and let them color away!! The front of this is designed for you to tape your business card on if you are planning on using it to promote yourself!! I can't believe Halloween Week is nearing the end. But that doesn't mean there won't be more 3D Halloween items coming. After all there is still a half a month to go!!!! I LOVE using wheels and I also LOVE glossy card stock. SO I got out the new Stampin' Up! "Haunting" jumbo wheel and I was ready to play. I took a piece of glossy card stock and wrapped it around the can to see how big I needed to cut it. After determining that I cut the card stock and ran the Embossing Buddy over it so I wouldn't get a lot of black embossing powder spot where I didn't want them. I didn't really think it would work on glossy card stock but I was willing to give it a try anyway. Much to my surprise it worked rather well. On the upper part of the sky where I had touched the card stock with my hands there was a large collection of embossing powder. The oils from my fingers had left some residue behind and the embossing powder just stuck to it. I used a paint brush and removed it. 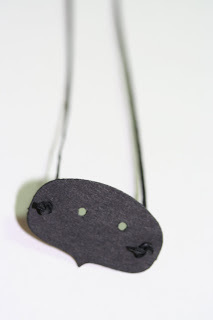 I heated up the black embossing powder and went back to my table to think some more. A "Halloween" spectrum pad would have been an ideal thing and since there is no such thing I had to work out something on my own. SO I started with the ground. It was fall but it's only the end of October so the grass could be green. I didn't want to use brown, I wanted it to look a bit festive and not drab. SO I went with Old Olive. It was a dark enough of a green that didn't have that fresh spring or summer look to it. I applied it with a sponge going from left to right and then right to left. You want to do this in one long swipe so you don't get areas of concentrated ink. You can go over those areas and they will blend enough to look just fine. In the photo the ground looks more grey. The flash on the shiny card stock created that effect. It really is Old Olive and it REALLY does look nice!!! My next color was Pumpkin Pie. Again I sponged the ink on from left to right and back again. I wasn't sure how far up to go with that color. I did know that I wanted the characters eyes to have a glow to them so I had thought about doing their eyes in a Green Galore but I figured once I ran across it with the Pumpkin Pie everyone would have brown eyes so I just left it alone. I decided I would go as far as the tops of the heads and then just added a couple more swipes of Pumpkin to the lower part of that area. I waned the part closer to the ground to be darker. I did this because I thought their eyes would stand out better and not look so orange. And again I was shocked, it worked!!!! For the upper part of the sky I just sponged on Night of Navy. On the two upper layers I did run a bit of the color I was using over the other layer, just on the edges. I wanted the colors to blend and I didn't want a white strip between colors. I tried to keep away from the colored areas as much as possible because I didn't want to mute the effect I had created. After I finished the Night of Navy I took a paper towel and wiped the card stock from left to right. Ink will bead up on embossing powder. SO back to the can. 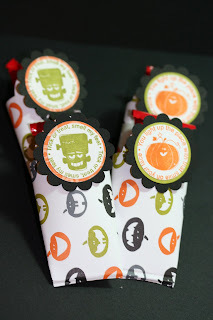 I taped the creatures around the can using the Stampin' Up! Sticky Strip. Regular mono adhesive will not hold with this, especially when using glossy card stock. It's just too stiff of a card stock to hold. I ran two lines of on all edges. This is NOT coming off this can with out a struggle!!!! I also used a little Sticky Strip tape on the top of the can to affix Frankie. I don't think I would have needed to but the tape was there and I was there!!! I filled the can with candies but I didn't glue the lid on yet. I will glue it on with Crystal Effects. I use to use Super Glue but I had gotten too much of it on my fingers in the past and when I found out Crystal Effects will do the same job without the smell or danger of living with a can glued to my hand for a few days I thought I'd give it a try!! Now for the can, it originally was a can of sliced black olives. I opened the can with the Euro can opener. Mine is from Pampered Chef and I'm sorry to say I bought it because I wanted to open cans this way for crafting, not for any other reason!!! But I've made and sold enough things to make it pay for itself so the guilt there is now gone!!! You don't really need to add any more embellishments to this can. The effect of the embossing powder, inks and glossy paper are just enough. But if you really want to add more embellishments you could decorate the top more. It all depends on what you are going to use them for and who is going to get them. These are VERY fun to make and with sponging the color on it makes them a quick project to do too. These would be great for Halloween Gifts, Customer Appreciation Gifts, Hostess Gifts, Stamp Camp, Make n Takes and Craft Fairs. Start saving those cans now!!! I hope you are enjoying Halloween Week!!! It's day four of "Halloween Week!" I hope you are finding some inspirations from the items I've posted so far!!! The larger pillow box is a purchased one from Clear Boxes. I think they changed their name but that link will get you there just the same. They have TONS of clear boxes in various sizes. Including the ones that hold cards and envelopes for gift giving or selling in sets. The smaller pillow box is the one by Stampin' Up! It's such a cute size and more economical to fill! I ran both through the Cuttlebug swirl folder . It's more difficult to see the swirls on the smaller one. The acetate isn't as thick as the larger one is so the swirls didn't get white around the edges like they did on the larger one. But in person they are still cute. For the smaller one I cut the box out of acetate and then used the folder to emboss it. I taped it together with the Stampin' Up! Sticky Strip tape. That stuff hold so well. I added the candies and folded the edges in. I then added the ribbon and called it done. I wanted it to be a quick and simple project and it was exactly that. The larger one took a bit longer to do since there was some stamping involved with it. I didn't want to add anything stamped with the smaller one, you wouldn't be able to see the contents as well. But the other one was large enough so I was able to add some images to it. I used the pumpkin from the Stampin' Up! "Autumn Harvest" set. I colored it with the Pumpkin Pie marker and cut it out. I used the large oval punch and punched out a Lavender Lace piece and I used the medium oval punch and punched out a white piece. I layered them together and added the pumpkin. I cut a piece of black card stock 1-1/4" wide and 7" long and made a belly band to go around the box. I glued it in place and added a piece of ribbon to the top of that. I then added the pumpkin layers. I filled the box with candies and closed the ends. You get the best of both here. You can see the candies inside plus you get to use stamped images as well!!! Again these items would be great for Customer Appreciation, Hostess Appreciation, Craft Fairs, Stamp Camp, Make n Take and if you die cut the boxes out first they would be a fun project for kids to do too!!! I am hoping you are enjoying "Halloween Week!" There's still more to come!!! If you have any questions please email them to me, Blogger does not allow us to reply to your comments. I never ignore your questions but I can not reply without any contact information. Day three of "Halloween Week!" While shopping at Archivers last week I saw this adorable decorative paper and I just couldn't pass it up. I don't shop there very often and when I do it's rare that I would by paper of all things. But this paper was just too darn cute to pass up. And then I found out something I REALLY didn't need to know. When you purchase their paper you can go back in the workroom and pick out a die cut to use on that paper. Well how tempting can that be. I did go back in the workroom without buying any paper. That is allowed too. I was looking at the die cuts to see if there was anything I would even want and that would determine if I was actually going to buy that piece of paper. Well, needless to say I found something and I bought the paper. They have the most adorable box die cut template. And with Halloween coming up, what a better time to use a box for candy??? SO I got the box cut out and I went home to create. But I didn't create right away. I folded the box up but I didn't tape it and I set it aside. I set it aside until tonight. I remember last Halloween my friend Peggy brought over some candy corn and peanuts mixed together in a bowl. She said if you eat them together they taste like a salted nut roll. SO I thought I could fill the box with candy corn and peanuts. But how were you going to be able to see it??? My next step was to cut a hole in the box and add a window using acetate. Now you can see what's inside. And then I sat there and looked at the box wondering what else to add to it. Nothing too fancy since the paper was not that elaborate. Something simple like the paper and easy to do. I had just purchased this adorable Sizzix die cut at Joann's. It has a Skeleton with hands and a hat and the word "sweet." I figured I could get a LOT of use out of this die cut just because of the word "sweet." I'm thinking of Valentine's Day plus any other time I will be giving a gift item with candy in it. The next thing was to try to figure out what colors I wanted the words in. Well of course black!!! But I put the black across the window and it just looked too drab. SO I used Pumpkin Pie card stock and did the words again. Alone they didn't look very good. SO here I sit with two words cut out and not knowing what to do with it. I stacked them up and set them aside. The black slid a little off the orange and the light bulb went on and the next thing I knew I was taping the words together as you see them. I set them on top of the box and liked what I saw. But it still needed more. The measurements of this box are 4" x 2-5/8" x 7/8". You can make this box just a bit smaller using the tissue box I posted yesterday. The paper I used here is called "Spellbound" by Making Memories. These would be great for Hostess Gifts, Customer Appreciation Gifts, Craft Fairs, Make n Takes and Stamp Camp too! I hope you are enjoying "Halloween Week!" I have more items on my list and I will be working on them and posting them here all week!!! I made this cute Frankie candy box using the tissue holder pattern I created a while back. Just follow the tissue holder pattern but don't make a hole for the tissue. You can make a hole in the back and use acetate for a window if you wish. I opted not to. These boxes are simple enough to make and you can get two from one sheet of card stock. I do recommend you fill them with wrapped candies or pour candies in a plastic baggie that is meant for food. I think you could have a lot of fun with this project. I can see doing this as a class project with kids and adults alike. 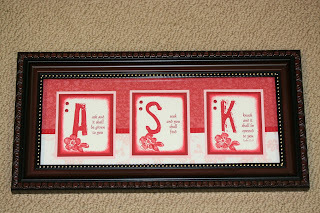 These make fun gifts, Make n Takes, Hostess Gifts, Customer Appreciation Gifts, they are great for Craft Fairs too!!! Stay tuned for more 3-D Halloween items. I have several ideas ready to put together to share with you this week!!! You will have plenty of time to make them before Halloween, well... depending on how many you are making!!!! For me I make one or two to display ad rarely make more than that unless I am using them at a craft fair!! I was out of town for a few days. Didn't know it did you??? I had pre-posted some items so I could take a short break and enjoy my time. We took a trip up to the north shore of Duluth. It was very fun, very windy and very cold at night!!! It was nice to get away and give my hands a break. The are beginning to feel the effects of the many years of crafting!! But they feel good now and I'm ready pick up where I left off before we left. I do have to say that I usually get inspired when I go up there but there didn't seem to be very much new stuff up there to get inspired by. But we did buy a LOT of beads while we were there!!!! It's "Halloween Week"!!! My plan is to have a Halloween item to post each day for a week! 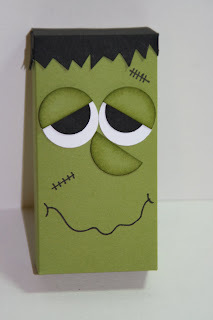 It may be a 3-D project such as this one or a card but the theme will be Halloween!!! I'm leaning more towards the 3-D projects. 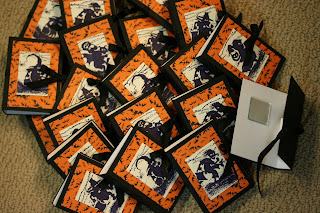 There's lots of parties coming up and the 3-D stuff is more fun at a Halloween party than a card!!! Now I must tell you, I have no idea where these ideas come from!!! And sometimes things like that are just best left alone!!!! 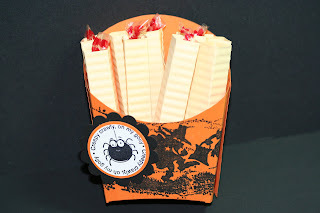 LOL I had been thinking of the Halloween Fries box I made last year and how fun it was to do and the next thing I know I got the idea for the fries. I was going to use Sixlets but I couldn't find any at the store that weren't loose in the box they came in. Didn't they use to come in little cellophane "tubes?" Maybe they still do but I couldn't find any. I had some Smarties so I took the measurements from there and the rest is history!!! First you need the fry box. You can find the pattern by clicking here. I printed mine out on Pumpkin Pie card stock. I cut the box out and scored the lines. I then used the Stampin' Up! "Haunting" jumbo wheel with Basic Black ink. After I stamped the image on I glued the box together with tacky glue. I don't know if you can see it in the photo but I did glue my box wrong. The front flap sides should be on top over the back side flaps. I wasn't paying attention when I was doing the gluing. I set it aside to dry. For the "fries" I took some Barely Banana card stock and cut it 2-1/4" x 3-1/2" I scored it on the shorter side at 1/2", 1", 1-1/2" and 2". Now run it through the paper crimper and then fold the score lines. Glue the smaller area of card stock. Make sure that part goes on the inside of the "fry." Once the glue is set up you can insert the candies. I did put the candies in so the twisted end was on the side of the fry and it didn't show. It's up to you how you want to display your candies. But you may want to leave one end showing so it can be removed easier from the "fry." Though they are big enough to put your little finger in and push them upward! Personally I like them better without the twisted end showing. I did add a layered scallop spider on the front. It's from the Stampin' Up! "Batty for You" set. The photo doesn't do the fries justice. The light bounced off them and really washed them out. But try one yourself and you will see how cute and easy they are to make. If you're going to make a bunch of them I would suggest scoring a full sheet of card stock first and then cutting the pieces out. It will save you some scoring time!!! I don't recommend crimping before you cut. The cutter will squish the crimp marks. Sorry you'll have to crimp them one at a time. But it goes fast and it's a fun thing to do!!! These would make great party favors and can be done in pretty much any theme too!!! A fellow demonstrator and blogger Vivian has been in the hospital for over a week. She is now home but is feeling very depressed. Get well cards would really cheer her up and she is offering Blog Candy too!!! If you have time please take a moment to visit her blog "Florida Stampin' With Vivian," she's a wonderful stamper and her blog has lots to offer, you won't be disappointed! If you'd like to send a card to cheer her up you can mail it to her at the following address. It's never fun being sick. But it is always nice to receive a card and know that other people are thinking of you. I know Vivian reads my blog and I want to say I hope you are feeling better Vivian. And this is the Thank You card I made for Sue to go with the "ASK" frame I made for her. I wasn't sure where I was going with this card. I cut a half sheet of Riding Hood Red card stock and I cut a piece of the "Bella Rose" Designer Paper and I just sat there and looked at the card. I wanted to use the scallop punch for the "Thank You" again!!! But I didn't ant it to sit on top of the card like I did for the one I made for Denise. What to do, what to do???? LOL The big move was to tape the rose side of the decorative paper on top of the card stock. Then I decided I was going to use the decorative paper as a stripe on the left side of the card. I cut the layers and taped them together and set them on top of the card. It was ok but the right side needed something "different." 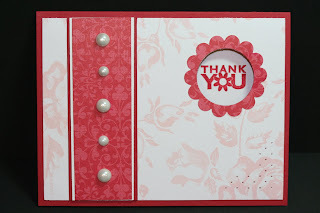 I decided to use the circle punch and make it so the "Thank You" would be on the inside of the card. I got to use that scallop that I wanted to!! I liked what was happening with the card but it still needed something more. Some bling??? Maybe!!! Then I walked away from my worktable for a minute and when I came back I looked at the HUGE mess on my table and saw the Pretties Kit sitting there and I thought the pearls in it would look FABULOUS on that strip. SO I took three medium size ones out and set them in place. It looked ok but I thought maybe five would be better. When digging in the box for two more that size I saw the smaller ones and took them out and set them in place. And the next thing I knew I was "gluing" them in place with Crystal Effects! And tah dah, the card was done!!! It looks simpler than it was. And to make more it would be very simple and very quick. It's always that first one you make that takes the most time, isn't it??? A Thank You Card for Someone Nice! 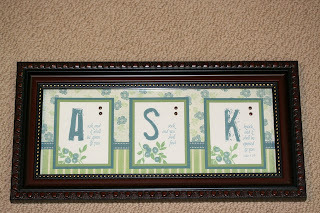 This is the thank you card I made to go with the "ASK" frame I made for my friend and fellow demonstrator Denise. I used the Stampin' Up! 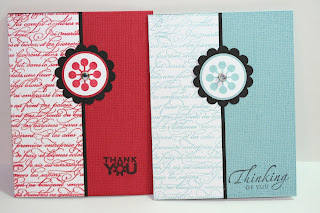 "Pocket Silhouettes" set and the "thank you" from the "Wow Flowers" set. I stamped the "Pocket Silhouettes" flower image on glossy card stock with VersaMark and used clear embossing powder. After the paper cooled I sponged Sage Shadow over the entire area. I added layers of card stock behind it. I chose the colors that were in the "Autumn Vine Designer Series Paper. I am REALLY loving that pack of paper!!! Originally I had the layers stacked on top of each other like I would normally do but I wanted to shake this card up a bit so I gave the layers a bit of a twist look to it by turning each color a bit as I taped it in place. I think it gave the card a bit of flair!! The main part of the card is a half sheet of Chocolate Chip card stock. I cut a piece of Sage Shadow 5-1/4" x 4" and stamped the "Polka Dot" background on it using Sage Shadow ink. Then I cut a piece of the decorative paper 3" x 4-1/4" and taped it in place on top of the Sage Shadow. I taped on a piece of Chocolate Chip grosgrain ribbon where the two pieces meet. I used the scallop punch and layered a couple of circles to it. The "Thank you" was stamped first and then punched out. For the flower I used a rhinestone from my brads. I had gotten a bad brad, the stone was stuck in it crooked and there was no way to fix it so I took the stone out and used Crystal Effects to "glue" it in place on the flower of the "Thank You." It was a very fun card to make. There is SO much to post this time of year that I get a little behind. First I want to say that the DIVA Day event on Sunday was a blast. Sue is just SO good to us. She had 5 cards all ready for us to just sit and stamp and put together. NO cutting at all!!! Gotta LOVE that. It's such a treat to not have to cut any card stock. I can't say it enough, she's SO good to us!!! 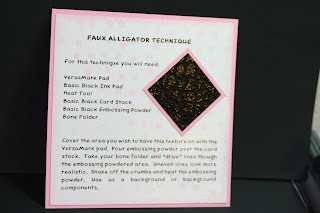 One of the items to make was a cute little "Faux Alligator Skin" card. Oh and for each item we make she has all the information printed out on a sheet. It has materials and the how to. I LOVE that!!! And I LOVE the hands on with the techniques. SO here is my next technique page. The "Faux Alligator Skin" technique! It's actually very easy to do and the results are fabulous!!!! Cover the area you wish to have this texture on with the VersaMark pad. 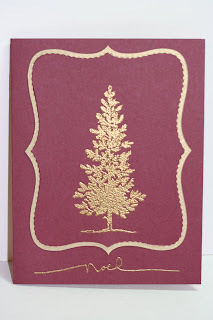 Pour embossing powder over the card stock. Take your bone folder and "draw" lines though the embossing powdered area. Uneven lines look more realistic. Shake off the crumbs and heat the embossing powder. Use as a background or background components. Isn't it just a fabulous technique. You can use other colors too. Experiment and play, it's how you learn things!!! The pages are coming along as well as the remake on the first set of 20. I will create a special post when they are done and ready to sell! I know there are a lot of you waiting for these. I do ask that you be patient with me, I'm working on them plus other stamping things and the daily life things as they come along too!!! Those are the ones that slow up my stamping!!! UGH!!!! Thank you Susan for leaving a comment and the size on the ASK frames. Sometimes I get so into my posting that I forget some details. And it is impossible to reply to comments. Blogger does not offer that option. Susan was the lady I got the frame from. She also has a blog, Created With Love by Susan. Hop on over to her blog and see her fabulous creations. She's a wonderful stamper, you won't be disappointed!!! She's got a few things on there that have REALLY caught my eye and I may just have to CASE (Copy And Study Everything) them!!! For the measurements, I used size 16 font on my computer and I cut the pieces out after I printed them. They measure 2-1/2" x 3-1/8". That was the hardest part for me, to get the pieces cut out right. SO I would recommend you print them out on copier paper and then work on cutting them out. I set up my word processing program to make 3 columns and I did one letter/wording in each column. And I got 3 sets per page. Cut a piece of copier paper 2-1/2" x 3-1/8" and lay it over the words to see where they line up. Then trace around the words and using a paper cutter for straight lines, cut it out. 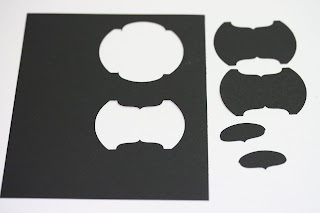 It's the easiest way to do it until you get the three done and then if you are making more you can lay your finished ones on the next set and trace the lines for cutting. It's always that first one that takes the longest amount of time. A- Ask and it shall be given to you. The font I used is called "Dolphin." I'm not sure if it's one that comes with your computer or not but you can find a lot of these fonts for free on the Internet by going to http://www.google.com/ and doing a search for a particular font. The frame itself measures 14" x 7" and you can get them anywhere that sells frames. From your local drug store to the larger department stores. Just look for the 14" x 7" measurements. Mine had a double mat in it that I took out. At first I was fooled by it and was having trouble finding the frame but after realizing I didn't need the mat, just the size I was set!!! I cut my 12" x 12" decorative paper 2" x 12" and 3" x 12". You may need to trim it depending on the size of the opening in your frame. Remember to ALWAYS measure twice cut once!!! You can get two frames from one piece of 12" x 12" decorative paper. 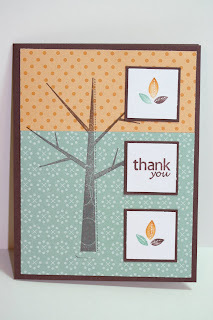 And what I LOVE about the Stampin' Up! decorative papers is that you pick one sheet and you will probably use the back of it as your second design in this project. They did such a great job pairing up the papers!!! Ok, I hope I didn't miss anything. If I did please email me, I can't reply to your comments, sorry. Oh, one more thing. Next week will be devoted mostly to Halloween. There will be more projects than cards so stay tuned!!! Wednesday just snuck up on me!! I can't believe how fast the weeks are going. The next thing I know the tree will be up and I'll be wrapping gifts for Christmas. I need to have less things to do so time drags!!! LOL But there's no fun in that. At least I'm having some fun!! 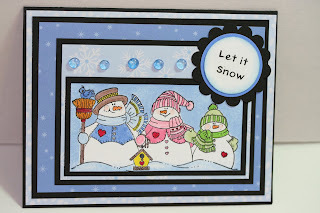 Here is my card for the Wednesday Sketch Challenge over at SplitCoastStampers. It's got LOTS of layers. Right up my alley!!! I ran across this cute snowman family stamp in my pile of sets. It's also got a mitten, snowflakes and a cute little border stamp too. I've had this set for a long time and this is the first time I've used it. I was going to make a snowflake background but I ran across a package of snowflakes decorative papers I had gotten last year at Wal-Mart. You know me and snow and when I saw this package of paper I just had to have it. 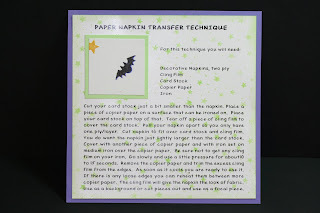 SO most of this card is done using the decorative papers. The words were done on the computer and punched out and layered. I colored in the family using markers and I did make a mask of the family and I sponged i n the background in Bashful Blue. The card really didn't take all that long to make. When you use decorative papers for your background it sure goes a lot faster!!! 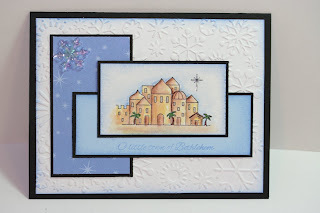 If you have time do the layout and then head on over to SplitCoastStampers and download your card to the gallery. I look forward to this every week and I'm pretty disappointed when I can't play that day. Not that I can't do it another day and submit it. I just like to do it on Wednesday. I had gotten one of these from a gal named Susan. A while back I had posted a bracelet I made at a class I took and Susan contacted me because she wanted one of them. Well, I wanted one of her ASK frames so we traded. She loved her bracelet and I LOVE this frame. I did make a couple of them the other day for gifts. The Riding Hood Red one is for my manager Sue Hi Sue!!!!) and the fall colored one is for a fellow demonstrator Denise. Those two haul me around town when we have events that are not in my comfort zone of driving. They are SO good to me and I REALLY appreciate the ride. And to show my appreciation I wanted to make both of them an ASK frame. Click on each of the photos for a closer view. These are not all that difficult to make once you get the words set up on your computer. I just print the words out in the Stampin' Up! colors and stamp on the larger capitol letter. I use the Stamp-A-Ma-Jig to line up the letters. It is a little important to have the tops of the letters about the same distance from the edge of the card stock. Mine are close enough, keeping in mind that it IS a handmade item! Many of you have asked how I got the Stampin' Up! color codes, the RBG code. (Red, Blue, Green code). There was a place on Splitcoaststampers in one of the forums that has it listed. Though I did find that the colors weren't all accurate. SO what I did was I went to the Stampin' Up! website and clicked on the online catalog. I opened it to page 4 and 5 where the colors are listed. I did a print screen on those pages and from there I saved it onto my computer. When I was ready to find a color I opened the page using the Paint program that comes with Windows. I used the little eye dropper tool and touched it to the color I wanted and then went up to the color icon and clicked on it. Under it pops up "edit colors" and I clicked on that. Then a color window pops up and from there I clicked on "define custom colors." It's in that window that you will see the numbers for the Red, Green and Blue colors that when mixed together in the proper numbers will match the Stampin' Up! colors or any other colors you are working with. I write these numbers down and when I am in my word processing program I will highlight my words and then go to the color and add those numbers in. Then I can print out my pages in the colors I need!! It takes a little time to work with this but once you get the hang of it you can do anything in whatever color you need!! If you would like the list of colors that I found elsewhere I would be more than happy to email them to you but I won't be able to handle much of my emails until Sunday or Monday. Wouldn't these make fabulous gifts??? I ordered some extra paper and I'm going to offer a class on these for my stampers! I started this notebook out a bit differently than I finished it. I had the stamped images moved up higher on the decorative paper and I originally was going to have bows and buttons up below it. I thought it would be cute but then again I thought about where I was going to be keeping my notebooks. My purse is not a good place to keep anything with any embellishments on it at all. They usually get hung up on something and they rip or fall off leaving the cute little notebook not so cute anymore. SO here it is a very plain fairly smooth front! I did use the new Autumn Vine Designer Series paper. This decorative paper pack has such adorable pages in it. It goes perfectly with the new "Season's of Friendship" stamp set. The stamp set I used to make these little notebooks is the new "Pocket Silhouttes" set. They are SO cute. There was one more stamp in the set, it had a broader leaf on the stems. I like it but I could only pick 3 and I left that one out. I wanted the 3 that were the taller leaner looking ones. They fit well in the space and they were more uniform in shape than the other one. I did use the other one in a frame I will be posting soon and then you can view it there. But here you have it!!! Cute little notebooks that would be great for Hostess Gifts, Customer Appreciation Gifts, Make n' Takes, Craft Fairs and even Stamp Camp! I mean, who can't use a notebook?? I created some fun lip balm gifts for the DIVA's today. These are a LOT of fun to make. I have made lip balm stick holders before and enjoyed doing them. These are just a little bit different. They have a small mirror on the inside. I saw that at one of the Stamp Shares I was at. I thought it was a clever idea and I went shopping for the mirrors at Joann's. I adhered them in place using the Sticky Strip. I figured they would need a stronger tape to hold them in place. SO far they are still stuck on the card stock!!! I used the new "Haunting" jumbo wheel for the fronts of these. Just load up a black cartridge in your wheel and you can stamp a long time!!! Aren't those characters just adorable???? Here is the link to the other lip balm holder I did. And there you will find the link to the instructins and pattern to make your own. They don't take long at all to make. These would be a fun thing to make for those teenage girly parties!!! Oh my, another case of "Shameless Casing!!!!!" 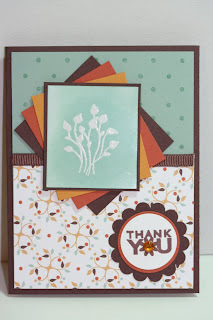 I saw this card on Kari's Stamping Made Easy blog. I downloaded the card to my computer and kept looking at it several times in one day and I just knew that I HAD to make one. It's such a stunning card. I used the Stampin' Up! "Lovely as a Tree" set and a VersaMark pad. The words are from the "Many Merry Messages" set. I was surprised when I was looking through my stamps that I had EVERYTHING to copy this card exactly as Kari did!!! First of all I LOVE the Bravo Burgandy used. I also LOVE the use of the new die cut, the gold embossing, the brushed gold card stock and not to mention how quick this card was to put together. Had I not already figured out our Christmas card for this year I think I would have just copied this one. It's absolutely gorgeous. I am looking forward to Sunday. It's DIVA Day! Us DIVA's will be meeting at Sue's house for a fun day of stamping and pampering!!! I always look forward to her event! She spoils us rotten. She has projects lined up for us to do. Cards to make and we all share our business ideas, project ideas and other things we found along the way. It's a great group of gals and we always have a great time!!! Sue is the best!!! We are not doing swaps this time. We are to make a card and repeat it using the six new Stampin' Up! "In Colors." And then we will take pictures of the cards for future reference. Here are my cards. Aren't they fun??? 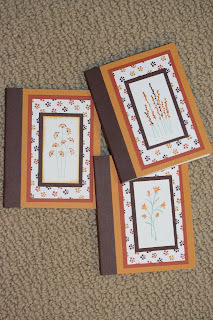 I used the following stamp sets to make these cards: Canvas, En Francais, Sincere Salutations and Wow Flowers. A few punches a rhinestone brad and some tape and I'm ready to go!!! It took me a while to figure out what to make and once the first one was done the rest were easy. Except I had to clean the stamps after each card. When making swaps you just use the same stamp and ink for each card. But they are done and ready for Sunday!